One of the most technologically advanced yet easy to use blood pressure monitors available in the marketplace today. The one step auto-inflation monitors makes self-measurement of blood pressure as easy as a push of a button. Whether the monitor is used to distinguish sustained hypertension from white-coat hypertension, improve patient compliance to treatment or as a preventive health management program, it can all be monitored using only one button. 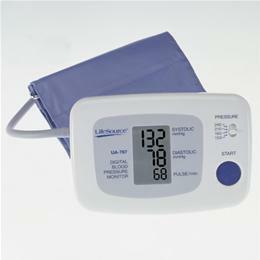 The 16mm digital display makes this monitor easy-to-read and offers a unique simultaneous readout of systolic and disstolic pressure, pulse. A large print instruction guide and quick start card are clearly written in English, French and Spanish. An industry-leading lifetime warranty.